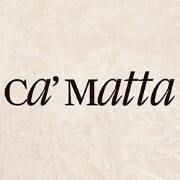 In a warm, elegant, comfortable atmosphere, Ca' Matta is a place of creativity and zest for life where you'll experience a different kind of cuisine, which cares for tradition and for the quality of local, seasonal produce. Ca' Matta, in fact, pursues the culture of food and wine and shall be happy to help you create your personal gastronomic itinerary. Because, every now and then, life deserves a gift.